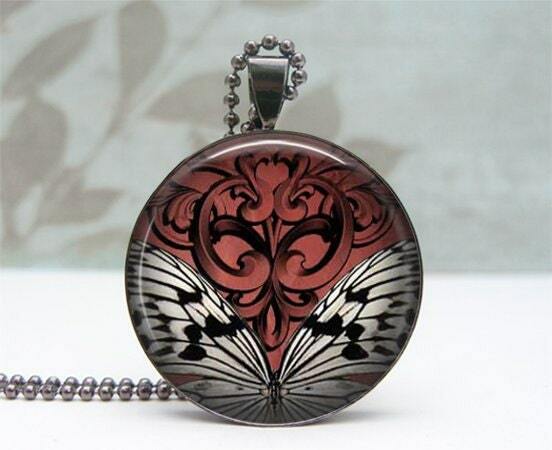 This high quality handcrafted pendant measures 1 inch diameter. It is produced using an archival high quality image which is then protected with a crystal clear glass dome that beautifully enhances the artwork. I must say that it's much more beautiful than I expected! It gives a 3-dimensional sense when you look at it and it has a vivid appearance. The chain is long enough to wear on my neck without opening the clips, because to open and close the ball chains can sometimes be a little difficult (I pushed it up for you when taking picture; it's a little longer than that). And the color is very nice; you can wear it with anything black and brown and it reminds me the melancholic weather. 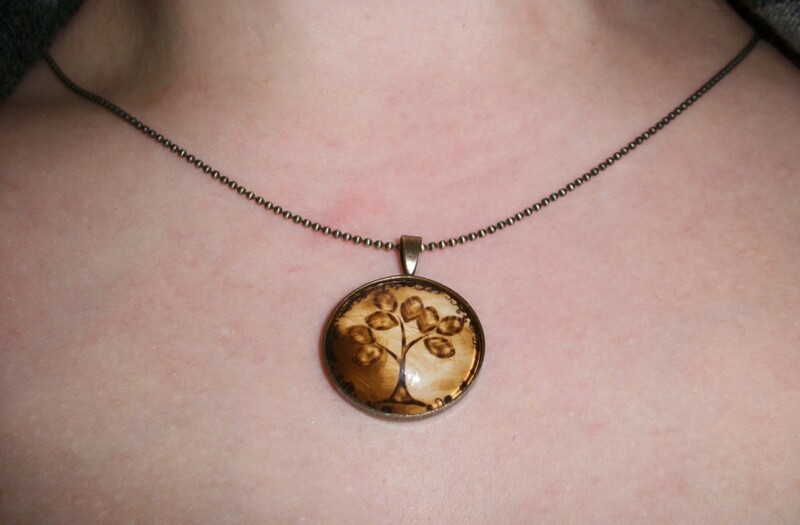 Imagine yourself wearing this pendant when walking on the yellow leaves among the autumn trees. How great! All I can say is that it's the product of a high-quality job. PS: She has hundreds of fantastic designs on her shop. I am Italian American & my middle name is Elizabeth. The Italian translation for Elizabeth is Elizabettas so to make it more unique I took the E off of it. I love doing affordable jewelry. I'm not a trendy person but when I see something I like I have no excuses for because I know it speaks to me for a reason that's why I like making eclectic jewelry so I can change my pendant like I change my mind. It's something that I feel speaks to the individual and artist in everyone. BUY IT: Prices are between $2.00 - $32.00. You can find chains and pendants (also personalized) in seasonal & holiday, retro & vintage & nostalgia, music & movies & fantasy, quotes & sayings, animals & nature & spiritual, art nouveau & 19th century, and cultural art images. Honestly, with so many fun pendants it's hard to pick just one. Oooh, I LOVE the Blue Green Elephant Glass Dome Pendant! That is going on my Wish List! is just one of my favorites. http://www.etsy.com/listing/89603514/youve-had-it-all-along-valentine Caught my eye all along but totally hard to choose because I really like butterflies too! I like the 'You've Had it All Along' necklace the best. I love the personalized photo pendant! 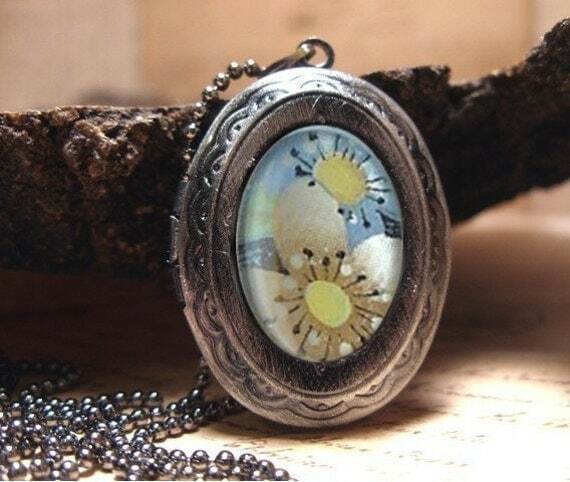 the vintage clock necklace is beautiful! I like the Blue Green Elephant necklace! 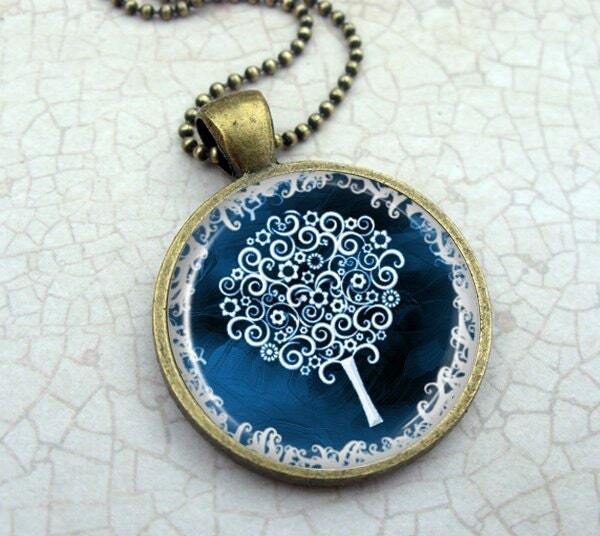 I absolutely love the modern tree necklace! The Fruity Leaf Necklace is gorgeous. What a gorgeous piece! Thanks for a lovely giveaway! 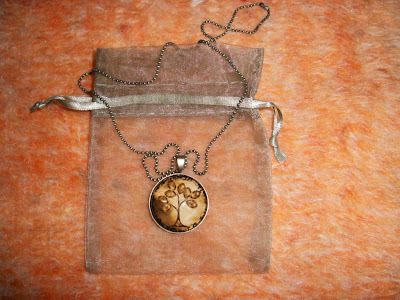 I would really love to win this beautiful necklace. The Heart over music notes Necklace in a Glass Dome Pendant! I'm a singer and my favorite color is blue! It would be perfect! 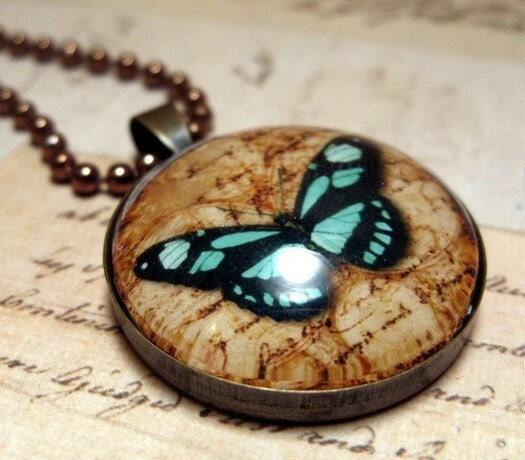 I also love the Turquoise Butterlfy Necklace - Glass Dome Pendant Vintage Copper! They are all beautiful! I love the Copper Tree Necklace! Love the Copper Tree necklace! This one would have to be my favorite. Mostly because when I was little my mom had a necklace that looked just like it. SHe recently died but the necklace was long gone, this is beautiful! My fav is Love. Pendant Necklace. Bubble Glass Dome Silver Pendant w/ Matching Fine Ball Chain!!! I loved the Jack Skellington Santa Necklace. Love the Damask Flower Necklace! I love the one with the Turq background & tree with lots of branches on it. That one is so pretty! My favorite is the Love. Pendant Necklace. Bubble Glass Dome Silver Pendant w/ Matching Fine Ball Chain. love the modern tree necklace! I love the Blue Green Dragonfly one. love the alice in wonderland, "drink me" locket! I cant decide! I love both the Audrey Hepburn and the Black Cat necklace. I would really love to win this! I love the White Counch Shell necklace. I like the Pumpkin Tomato necklace. My favorite is the Personalized Crown Necklace. Daydreaming and Queen Bee are my two favourites although the Vintage ones are all lovely. It's hard to pick just one. I love the Chickadee Glass Pendant Necklace - Silver. I like the Pinup Bike Rider Necklace. Fun!! I like the Pinup Bike Rider Necklace. Too cute!! It was so hard to decide! This one is my favourite! I like the goth clock necklace! so classy! I love the owl map necklace! The deer girl necklace is precious! Do I have to choose just one?! I love all the pin-up inspired necklaces! 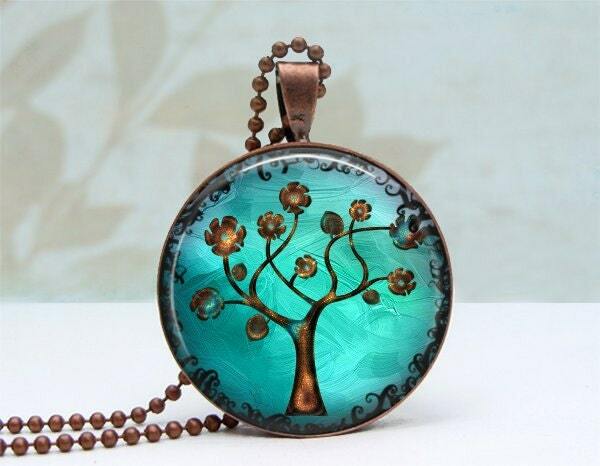 I love http://www.etsy.com/listing/82436048/modern-tree-necklace-glass-dome-pendant?ga_search_query=tree&ga_search_type=user_shop_ttt_id_6277575 beautiful colours! 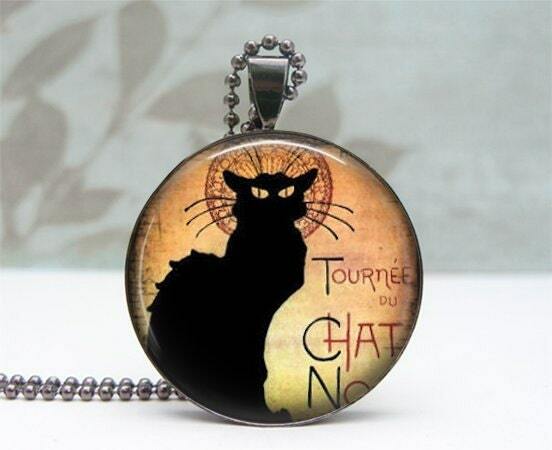 Black Cat Necklace - Glass Dome Pendant - Gunmetal - I love that one! 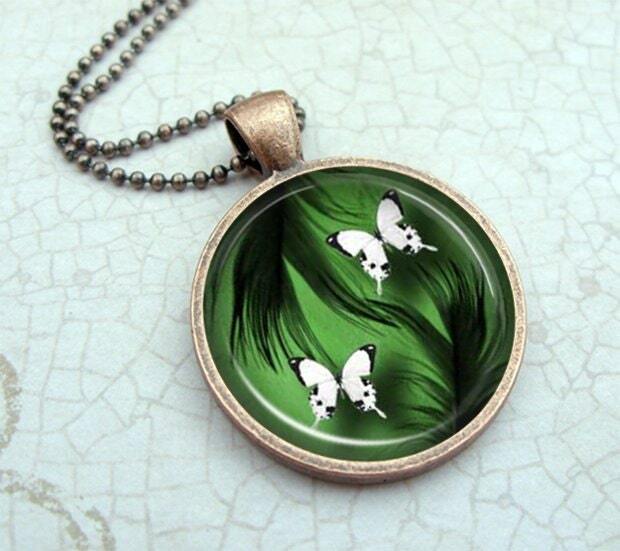 My favorite is the Green Butterfly in Blue-Vintage Copper and Domed Glass Pendant with Matching Ball Chain. I love this one:http://www.etsy.com/listing/78948525/keep-calm-and-eat-a-cupcake-glass. It's sooo artsy and i feel so cool if i wear this around. 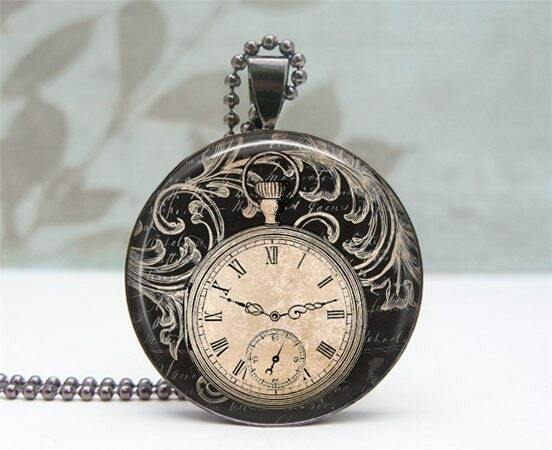 Love the blank vintage clock necklace! My favourite is the Queen Bee Pendant. I like the The Beatles Necklace. I think the Green Damask necklace is beautiful! I love the modern tree necklace! Pinup Girl Bubble Bath Glass Pendant Silver Necklace. The Modern Tree Necklace is one of my favorites! I love the Read necklace. I love the ghost tree and modern tree. I have a birthday coming up so perhaps I will give hints to my hubby. I love this butterflies necklace. My fiancee and I live in his grandmother's house, and she recently passed away. She LOVED butterflies (they are all over the house) and I am very close to his family. I would love to give this to his mother as a keepsake. Thank you for hosting!!! 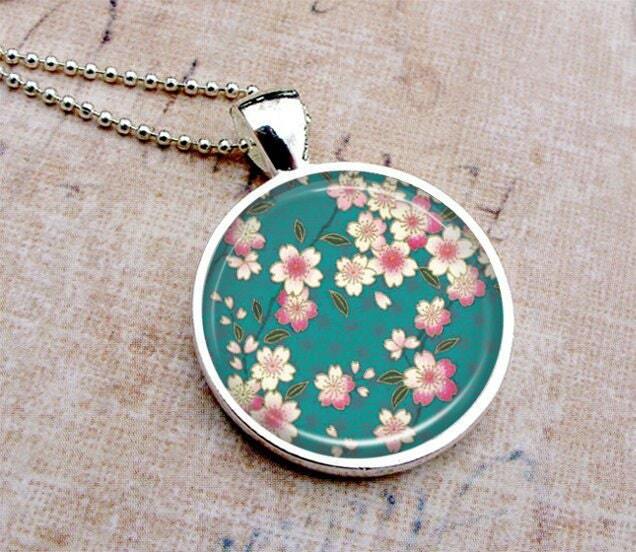 I like the Pink Black Floral Glass Pendant!!!! My favorite is the Umbrella Necklace - Glass Dome Pendant - Parasol Tea Party - Lynda Wheeler Original Artwork. I think the Pegasus Pendant is pretty!! I like the Queen Bee Necklace. Blue Green Elephant Glass Dome Pendent. So nice. The Modern Tree Necklace is my favorite item. I like the color combination and the design of the tree. My favorite is the Vintage Cross Necklace.